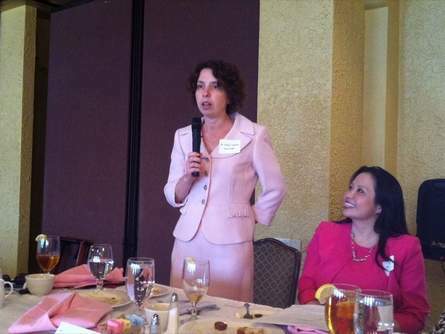 Oncologist-Hematologist Galina Vugman answers a question Wednesday at the annual Lakeland Breast Cancer Awareness Luncheon. Beside her is radiation oncologist Sandra Sha, another Watson Clinic physician on the panel. LAKELAND | Expressive arts to help patients heal, more options after breast cancer surgery and the intensely personal decision of whether to have both breasts removed were among multiple topics at the annual Lakeland Breast Cancer Awareness Luncheon last week. A common theme in the speakers’ talks was the many individual choices involved in coping with cancer, trying to avoid the disease and helping others deal with it. For almost 250 women attending Wednesday at the Lakeland Yacht & Country Club, these “fifty shades of pink” were compelling. At least 1 in 5 of the women was a breast cancer survivor. Others know or knew someone who had breast cancer. Choices, like mammograms and exercise, begin before a cancer diagnosis. Walking an hour a day reduces the risk of breast cancer by 14 percent, said Dr. Elisabeth Dupont, breast surgeon and medical director of breast health services at Watson Clinic Women’s Center. Walking faster or doing more reduces risk further, Dupont said. And women who develop breast cancer can reduce their risk of recurrence up to 30 percent with more intensive exercise of 10 hours to 19 hours a week. Less than 1 percent of the population has the faulty gene that led actress Angelina Jolie to have a preventive double mastectomy before she developed cancer, Dupont said. An increasing number of women, however, are deciding whether to have both breasts removed once cancer is found in one breast. Removing both “nearly eliminates” the risk of cancer on the other side, she said, but there’s no solid evidence it boosts life expectancy. With any cancer, expressive arts like poetry, painting or music can bring comfort and a sense of wholeness. “The arts do not cure, but they can bring healing,” said Cheryl Belanger, coordinator of the Moffitt Cancer Center Arts in Medicine Program. “It’s something we can all do in our own lives,” she said, sharing patient comments about how the program supported and nourished them. Moffitt, Watson Clinic and the Lakeland Breast Cancer Awareness Committee sponsor the luncheon. For breast cancer patients having radiation, the preciseness of the treatment is far greater than 20 years ago, said Dr. Sandra Sha, radiation oncologist with Watson Clinic. “It’s only getting better,” Sha said, with new procedures such as AccuBoost, which delivers radiation directly to the site of a lumpectomy. “There is absolutely zero radiation done to the under­lying structure,” Sha said, explaining how the breast is pulled away from the body. Tackling the question of chemo brain, Dr. Galina Vugman said many patients tell her their thoughts aren’t as clear after chemotherapy. Since they had surgery and often radiation, Vugman said, it’s hard to say chemotherapy alone is the cause. Studies say the mental fogginess lasts about six months, with difficulty finding words the most common symptom. “I don’t know that I completely believe the literature because my patients tell me otherwise,” added Vugman, an oncologist-hematologist. [ Robin Williams Adams can be reached at robin.adams@theledger.com or 863-802-7558.